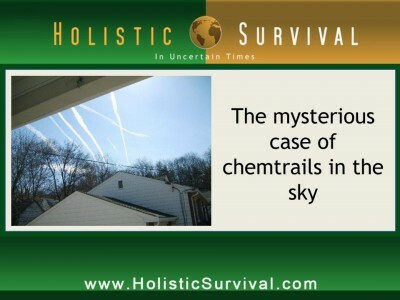 Join Jason Hartman as he interviews filmmaker and activist, Michael Murphy about chemtrails in our skies. Michael explains the difference between con-trails and chemtrails, with the significant difference being whether or not the trail dissipates or spreads out without dissipating. He talks about geoengineering, in which its purpose is purportedly to block the sun and mitigate global warming, but from Michael’s studies, he found studies by NASA that state by spraying aerosol into our atmosphere, it will actually warm the planet. He also found that this does produce some temporary regional cooling, but since the aerosol creates a blanket, it creates an overall warming. He cites examples, such as nighttime highs on the increase. For more very interesting details, listen at: www.HolisticSurvival.com. Michael goes into the environmental implications. 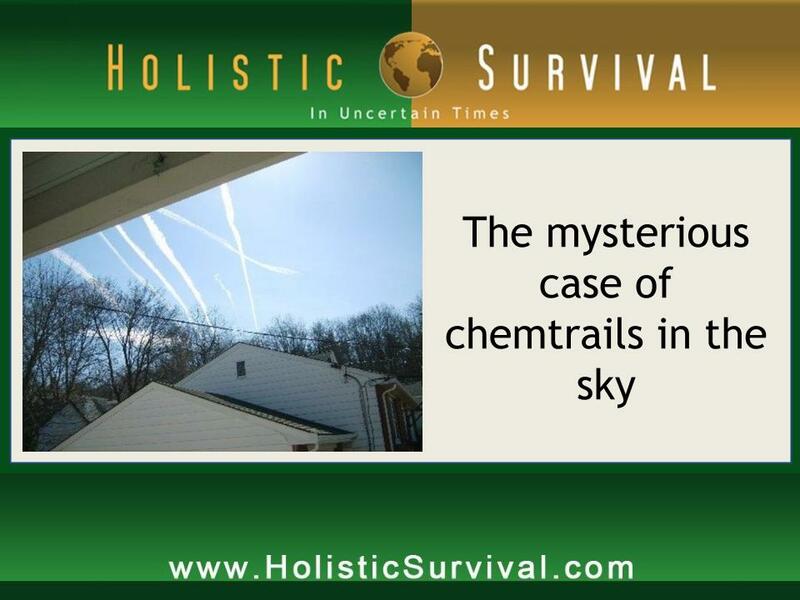 The chemtrails can consist of aluminum oxide, barium, and ethylene dibromide. In various parts of the country, trees and wildlife were dying, and upon testing the pH factor of normally acidic soil, found that the soil was changing to alkaline. He also cited an example of solar panels not working as efficiently during the chemtrail releases due to blocking of the sun. The use of these chemicals in the atmosphere is affecting organic food production, leading to the concern that the agenda is to prevent us from growing organically to make us dependent on corporate food production and GMOs, such as Monsanto. Beyond these agendas, chemtrails also produce weather implications, such as harsher storms and droughts and record lightning strikes around the world. Through a process of heating, the use of these aerosols can be used to move storms, to control our weather, corporatizing to put the power in the hands of the few and creating damage to every living thing on the planet. Michael points out how HAARP is directly related to the use of these aerosols. Shockingly, weather derivatives are being traded on the Chicago Mercantile Exchange. To drive home the point, Michael talks about several recent weather disasters during which GMO corporations were able to capitalize and government was able to buy up land. Michael also discusses the military benefits of controlling weather, how it’s an effective means of controlling wars, controlling the populace, and blame it all on God. The motive is money and power, while the resulting consequences are disastrous, including the health issues that result. Narrator: Welcome to The Holistic Survival Show with Jason Hartman. The economic storm brewing around the world is set to spill into all aspects of our lives. Are you prepared? Where are you going to turn for the critical life skills necessary to survive and prosper? The Holistic Survival Show is your family’s insurance for a better life. Jason will teach you to think independently, to understand threats, and how to create the ultimate action plan. Sudden change or worst case scenario, you’ll be ready. Welcome to Holistic Survival, your key resource to protecting the people, places and profits you care about in uncertain times. Ladies and gentlemen, your host, Jason Hartman. Jason Hartman: Are you aware that the largest transfer of wealth in human history is underway? Are you concerned about protecting your income, savings or home equity? All these bailouts benefit the Wall Street crooks and the Washington elites while costing the middle class. Experts are predicting difficult times ahead. The only question is where will you and your family end up, with the haves and have nots? My name is Jason Hartman with Platinum Properties Investor Network. For 2 decades, I’ve made a small fortune in the most historically proven wealth creator. Don’t be the victim of Wall Street fat cats who line their pockets with your pension funds. We can teach you how to protect yourself and your family in these wildly turbulent financial times. Create and protect your nest egg the same way 85% of America’s wealthy do. If you’re interested in the most innovative financial education around, it’s urgent that you register for our next event. Learn more about this outstanding event and get your free CD at JasonHartman.com or call 1-800-40J-ASON, that’s 1-800-405-2766. Your investments could be gone tomorrow. Protect yourself and act today. Jason Hartman: My pleasure to welcome Michael Murphy to the show. He is a filmmaker, an activist – very interesting fellow. And he is the creator of What in the World Are They Spraying? – a documentary about what is going on in the skies. And as a political activist and president for the coalition against GO engineering, his work focuses on issues that go beyond the interest of the corporate mainstream media and includes all kinds of interesting stuff that we’ll talk about today. Michael, welcome. How are you? Michael Murphy: Doing fantastic. Thanks for having me on. More importantly, thanks for covering this issue. I believe there’s no more important issue that we’ll ever have to face on this planet. So I really appreciate you getting involved. Jason Hartman: In digging into this, I started to agree with that last statement. It is potentially the most important issue of all. And by the way you’re coming to us from Las Angeles area today and tell us how you became interested in this topic of what they’re spraying in the skies. And first of all some people may be skeptical that they’re spraying anything. I mean first question, I know this is a huge compound question Michael so pardon me. But there are two kinds of things that we see in the sky right? There are contrails and chemtrails, is that correct? Michael Murphy: Yeah there is and I’m gonna answer your long question with a very long answer. Absolutely, the difference between a chemtrail and a contrail, I guess we’ll start with a contrail. A contrail is natural and it occurs. . .it’s actually condensation trail behind an airplane. It occurs in a very specific conditions, typically above 30 thousand feet. And it’s very similar to when we breathe in cold air. So when we breathe you can see your breath and it quickly dissipates. There is a thing called persistent contrails, contrails that last a little bit longer, however eventually they dissipate. What we have been seeing on a regular basis since about the mid 1990’s is something totally different. We see these long trails that do not dissipate, they actually fall down and then spread out, and then completely, usually completely blot out the sun. What we see in the sky today matches geo engineers plan and proposals, to which we’ll get into hopefully in this interview, in the sky and the measureable fall out from these trails of aluminum bearing [00:04:50] which can match as geoengineer’s plan. Exactly – it helps match numerous geoengineering patents designed to specifically play aluminum oxide out of airplanes. So you made an interesting comment that many people might be skeptical that airplanes are spraying and I think it’s important to note that I certainly was. And the first person that told me that airplanes were spraying in the sky I really thought the person was crazy. It wasn’t until a couple of years later and I actually lived in Arizona and I noticed that skies were changing when I moved there in the late 80’s for college, I went to Arizona State, I noticed the deep blue skies moving from Chicago that was something that we typically didn’t have. In Chicago there was rarely a blemish at all, other than maybe when a winter storm came in or a monsoon came in we saw cloud cover, but I noticed that there. . .what appeared to be high cloud became the norm in the sky and I didn’t know what it was. It really was not until somebody actually pointed an airplane out, that was strange. I began to get curious and investigate this. And I notice that trail, which did not dissipate it actually fell down and turned into what appeared to be a high cirrus cloud. So I started researching and investigating this issue became deeply concerned after I went to a geoengineering conference in San Diego, and for 3 days geoengineers spoke of the plans and proposals to spray 10 to 20 million tons of toxic aluminum into our skies for what they said was that they didn’t go according to plan. And so it was an interesting conference. They spoke about many of the risks associated with these programs, but certainly we’re dead set on the programs in terms of what they wanted to do and then spraying these toxins. So it was very interesting, but very concerning as well. And I began to learn just how toxic and damaging these programs were, not only in human health, but really the implications to our environment are just to manage. Jason Hartman: Well, so the question is, and maybe the answer is still undetermined – so let’s assuming that they are spraying and maybe you can also talk about some of the proof of that that they are spraying – but what are they spraying for? Is it to prevent this potentially mythical global warming and that’s of course very debatable, whether it’s happening or not. Is it for health, is it to control our minds, is it to dumb down the population, is it to make crops not grow so that only seeds produced by Monsanto work and you know organic crops don’t work anymore, or is it all the above? Michael Murphy: Well I think you hit a lot of points tight on the head and I like to call these multi-agenda operation. And again getting back to what geoengineers are stating these programs are they say they’re to actually block the sun and mitigate global warming. However in my investigation I found studies done by NASA that indicate that spraying air salt into our sky will actually warm the planet. What we found was they do create a temporary regional cooling but being that the aerosol in the sky acts as a blanket it creates an overall warming of the planet. We have seen night time highs increase in the past 10 to 15 years. So again we have to ask what are the true reasons behind these programs, which is what I’d like to get into. But I’d like to talk for about some of the environmental implications in terms of what is being found. And up in northern California and what in the world are they spraying, we actually went into northern California. And the reason was this, about 7 years ago scientists began noticing that trees were dying, certain crops were not producing in getting the yields that they were getting just a few years back. And so they began to question what is going on. Amphibians were dying, the fish were dying, so they began doing pH tests, not only of the rain, but of the soil, and what they found was really really concerning. The rain and the soil, which typically in that area is an acidic soil was changing to alkaline and we’re not talking about 1 to 2 times, or even 3 to 4 times, we’re talking about significant changes of 10 to 12 times the normal alkalinity. Anybody with basic science knows that plant life that requires an acidic soil will start to die when that soil changes to pH, exactly what’s happening. During that same time period, they had noticed there was Dane Wigington, who owns the largest solar power home in northern California. He began noticing that his solar production was dropping up to 50 or even 60% on certain days from these trails. And that’s really what got him interested in this issue. Jason Hartman: So in other words what you’re saying is they were blocking out the sun, cooling the earth and the solar panels weren’t working as well, is that what you mean? Michael Murphy: Absolutely. And again geoengineer’s proposal are to actually block out the sun and then reflect the sunlight back into space, and that’s exactly what is happening with these trails. But again during the same time period the pH in that soil and even in the rain was changing so they began to test the rain. And what they found was deeply shocking. Massive amounts of aluminum, barium and strontium in certain cases the amount of increase 50 thousand percentage points just in a few years. Aluminum, barium and strontium will change the pH of rain and soil from acidic 2 alkaline exactly what was happening. So a deep concern and again I want to reiterate what they found in the rain matches geoengineer’s plan exactly what they began seeing in the sky matches what’s expressly outlined in numerous of geoengineering models and there are a number of patents, over 90 patents of devices that were designed to specifically playing aluminum and barium. So match those patents. . .
Jason Hartman: So that’s really interesting. You can find the patents at the patent office. So that’s public record right? Michael Murphy: It is, and you can also go to my website. And then there’s also a very good website, geoengineering watch.org and it has a list of all the patents. Specifically what many people call the smoking gun patent, geoengineering is the well thought patent, that again was specifically designed to spray these toxic elements from airplanes. So yeah many dots connect and the concern here is you had mentioned specifically about what one of the many agenda could be. And we did film in Hawaii and we stayed there for about a week. And it was a great experience for me, but also a very grieving experience. But I could share kind of what happened. We actually went up to an organic farm to investigate and it was a beautiful way to live and the reason was this, for the first time I was away from any corporations for my food, and when I woke up after the first night and I was really hungry and I said to the people that lived in this peaceful environment, they grew their own food and I said, “You know I’m a little hungry is there a store around here?” And they looked at me and they started laughing. And I said why are you laughing and they said look around. And I said I don’t get it. And they said look around there’s food all around you. Your breakfast is on the trees. And the reason I bring that up it was just a beautiful way to live and an incredible way to live, and for the first time again I was not dependent on corporation, I began living from nature. And the reason I bring that up is I learned a great lesson during that time and I really believe that the way that natural organic seeds were created was so that we could live dependent on nature, not dependent on corporations. Well I also just recently released a short film called Hawaii Revisited. And what I found was organic farmers on Maui and some of the other islands had begun seeing a steady decline in their ability to grow certain organic foods. Most of which have seen about a 50% decline in certain crops. And the concern and what we learned during this trip there is a new aluminum resistant seed. So we know conclusively that our soils are being toxified and contaminated with aluminum. Aluminum is very destructive to plant life. And we know that there is a corporate solution for this problem of aluminum. So a lot of people in Hawaii believe, including myself that this could be in part an agenda to destroy our soil so that nobody has the ability to grow natural organic foods, and that we become dependent on these genetically modified seeds. So impedes concern for a lot of people and really what it is is it’s a corporate takeover of natural systems. So that can be of concern of many people who are aware of this issue. Jason Hartman: Very interesting. Talk a little bit more about the food issue and the seeds. I mean Monsanto has been criticized pretty heavily for their hybrid seeds where they patented nature, which I think is ridiculous. The crop won’t regrow or regenerate like a normal crop will, forcing farmers to buy them again and running all sorts of small family farms out of business. Any more on the food production because food is everything, if we don’t have food that really is checkmate. You know the powers that be are a controlling population if we can’t produce our own food. Michael Murphy: Well that’s absolutely correct. And what they’re looking to do is corporatize natural systems. So we know that in it’s all an agenda for Monsanto be controlled and own our entire food supply, and you know if you look at the way that people now living in Hawaii really believe that that is the way that god intended us to live, so that we could be dependent on rain and other natural systems to get out food so that we wouldn’t have to serve what I call the beef. That this governmental corporate conglomerate that wants to control everything. And if you look at the freedom, you know with the people in Hawaii, you will find out that they live a very incredible peaceful life. And they don’t have to set their alarm at 6 a.m. and go in and work hard so that somebody else can make a whole lot of money, they live a very balanced life. They’re dependent on nature and they’re dependent on god, but if they don’t have the ability to grow their natural seeds and they have to go to corporations what are the implications with that? And what could happen to their freedoms, you know what are the rules, what are the requirements to purchase and to work with this corporation and that really truly is the end of freedom as we know it. Jason Hartman: It’s more than what you just said, which is all very valid. It is certain municipalities have, I guess, find people or restricted their ability to collect rain water. Some people put in these systems where they collect the rain water off their roof, which seems like a very good environmental thing to do certainly, use that rain water rather than taking water from the water supply. But they want to force people to be dependent on the grid and not be able to live off the grid. They’re corporatizing everything and it’s unbelievable. Michael Murphy: That is correct. And you know the folks in Hawaii they do not worship the beef. They do not support the corporate system and that is a threat, and we have to realize this is again, this corporate governmental conglomerate. And they want to control everything. They can’t control natural systems, so what they have to do is genetically modify it and hopefully we’ll get into the weather control application during this interview and talk about why and how this is all linked together. Jason Hartman: Let’s talk about the weather issue now. They’re using the global warming phenomenon or the global warming story, I should say, as an excuse to spray, but they haven’t admitted they’re spraying right? Michael Murphy: Well they have admitted doing some testing, but we are without a doubt in full scale deployment. And you know you’re in Arizona in the Phoenix area, and again you’ll notice that typically you’ll see these trails on a regular basis. Those were not there 15 years ago. Those were not there 20 years ago period. So we’re seeing this regularly on a daily basis. I get emails every day and reports of spraying. So again this is not testing, this is full scale deployment. I just returned from interviewing former weather man, TV weatherman and meteorologist, Scott Stevens, who believes that our weather is completely corporatize and you know if we look at the applications and what’s going on most people can relate that our weather is totally out of balance. And we’re seeing hurricanes we’ve never seen before, we’re seeing very intense storms, there’ve been very intense droughts. And we conclusively proved without a doubt these programs are real, they’re a threat to human health and ecology. I hope that we, during the interview, we can talk about the health implications because they’re unclassifiable in how they’re harming people. But, looking into weather control, let’s look how aluminum oxide and other particles can help these entities control our weather. If we look at aluminum, and again geo engineers say aluminum’s four times more reflective, it stays up in the air longer. And that’s why it is the particulate that they would like to use for these programs. It appears that aluminum, while it’s not a great conductor let’s say in wire around your home, it’s a very effective conductor in the sky. As a matter of fact many people can relate to the increase in lighting strikes. They’ve had record lightning all around the world and that’s because our skies are laden with toxic aluminum and as a conductor. Well it turns out that when they put this aerosol into the sky to harp another technology, they have the ability to use it and heat it up. And what that does it creates lifts in our atmosphere, and when we create a lift in our atmosphere it creates a low pressure system. And that enables entities to steer storms. And I recently returned in October from the American Association for Aerosol Research Conference, I spoke with many scientists including NASA scientists who all let me know that putting aerosol in our skies do effect clouds, it does effect precipitation, and aerosol in our skies can be used to corporatize let’s control our weather. So without a doubt, geoengineering, and I did speak with a NASA scientist. And I documented this and put together a short video but it’s called “Why in the world are they strained?” and we document, without a doubt, geoengineering could be used to corporatize our weather, but again meteorologist Scott Stevens believes that these problems not only have been started, but he believes that our weather is completely corporatized and there are a number of reasons why corporations want control of these natural systems. And, let me tell you, it’s not in the best interest of any of us. Weather control consolidates power into the hands of a few and creates damage to every living thing on the planet. Jason Hartman: Very, very scary, no question about it. Jason Hartman: I did an interview. I had a guest on that talked about HAARP. And the HAARP system, I’m not sure you’re aware of that – that array of antennas that is being used to manipulate weather patterns and so forth and has potentially military applications of course. The weather is a powerful thing militarily, but maybe the spraying aspect of weather control is more subtle or not? Michael Murphy: Well, the aerosols in the sky are directly related to HAARP. HAARP requires a plasma sky and it also requires a conductor in our sky to emit its frequencies through. But if we look at it from a corporate standpoint, many corporations at many different levels benefit. And that’s a very low level. Certain insurance companies and heating companies benefit. Through my investigation I found out, and this was a shock to me, that weather is actually being traded on the Chicago Mercantile Exchange whether derivatives are being traded. So we looked into this and I interviewed a broker from Chicago and, by the way, I’m putting together a new film called Why in the World Are They Spraying? And it’s gonna illustrate the weather control application and how corporations benefit from these programs. And we found out, at the very least, corporations can hedge their risk on whether. So if you’re an insurance company or a heating company, let’s say you know that hurricane Katrina was gonna hit and you knew it was gonna be about a $30 billion catastrophe, if you hedge your risk on $40 billion, well hey, you make $10 billion. Also, certain heating companies like Enron – by the way, Enron has a huge stake in weather control – well, they also hedge the risk. So let’s say if Enron requires a certain number of winter days to be below 30 degrees, and it’s gonna be a typically warm winter like we’re seeing so far this winter, they can actually hedge the risk so that they will not lose any money. And if they have the playbook, which we certainly believe that they do, there’s no way that they can lose. Weather control, we lose from it because we see also insurance companies and other people who are tremendously benefiting and other contractors who tremendously benefit from these weather disasters. And that’s digging a little deep. And is that happening? That’s very speculative. But we do know you had mentioned militarization of our weather, which we’ll get to in a second. But if we look at the second level to this, what we have – again, and we began to illustrate this corporate governmental conglomerate, the beast, which is trying to change every natural system. Well, weather control’s very similar to the genetically modified seed corporations because in their natural form corporations cannot control seeds. And people can use them and be completely dependent on God or on nature or on our creator. So they have to genetically modify it. And what they’re doing is using the authority of nature and putting it under the control of man so that men can gain money and this power. Well, they’re doing the same thing with our weather. What they’re doing is changing natural systems. And, if we look at companies who benefit, we can talk about two recent weather disasters I guess. In the late spring, early summer of this past year we saw tremendous flooding in the Midwest. And the army core of engineers came in and they started breaking the levees and flooding out farmland. Well, we came to find out that after the government broke those levees and flooded out that farmland, they actually started buying up the farmland because the farmers were devastated and willing to sell their land at pennies on the dollar. And what it was was a huge land grab. It’s tied into agenda 21. And what they’re trying to do is reduce the production of food. Henry Kissinger stated back a few years that in 2010 they were gonna start using food as a weapon, so we see a decrease in the food supply. It also helps through many other disaster and droughts in The US and then Australia and some of the grand producing countries that came into droughts, they were unable to get the yields that they used to get. So then we find out that through droughts Monsanto has this drought resistant feed which they begin to increase their market share through. And you know once a farmer contracts with Monsanto, they’re locked in for life because they don’t have the ability to grow natural organic food. So we see the GMO food companies increasing, a reduction food supply, and then we see a land grab which is associated with the objectives of Agenda 21 policies. So corporations, governments completely benefit from these programs but let’s take it a step further in terms of weather control. And Iran’s president, Ahmadinejad, just came out and he said weather control is being used to create droughts in his country. Well, weather control’s a very accepted weapon of war and it was actually used back in Vietnam and it was called Project Popeye. And what they did, they flooded out the Ho Chi Minh trail with 13 feet of rain in less than an hour. Think about how far we have come since the 60s, probably significant control on these programs. And it’s a very effective weapon of war because if you look at our Iraq war and Afghanistan, there was a huge concerted effort through the corporate mainstream media to propagate the public and to accepting that these wars needed to be fought. Well, if you control the weather and through HAARP it’s also said – and Secretary Gates a long time ago said that there is weaponry now that can create earthquakes, weather control and some other disasters. It’s a very effective weapon because instead of having to propagate the public you can just blame what’s happening on God. And that’s what is happening. Jason Hartman: What an incredibly effective but scary business plan they have. They’ve basically put all of this in their favor. I mean blame God for the weather, wipe the farmers out, come in and grab up their land for pennies on the dollar, control the food supply, just unbelievable. Michael Murphy: Yes. It’s absolutely rigged from top to bottom and there is your motive. There is your motive, money and power. Jason Hartman: Sure is. Well, if you’ve done the overview of the weather issues, those are so important and it’s so incredible. Is this done all over the world? Is it done just in big cities in The US? I mean someone must have documentation of where are these planes taking off and landing? Michael Murphy: Well, the question in terms of where they’re taking off and landing is not a simple one because these are worldwide programs, there are thousands of airplanes involved, so it’s not only one place. And it’s important to know geo engineers are proposing doing this on a global scale. And we have seen these programs in the trails over most countries but not all. There are a couple countries in Asia, some in Africa, that don’t report spraying whatsoever. But every NATO country and then many other countries do report the spraying. So Evergreen Air, which used to be a CIA front company, Air America, has been accused of being involved with this. I haven’t researched that part too deep, but they do boast on their website about their ability to use their tanker planes to spraying some of the Clorexit down in the gulf. So many people believe they’re involved. And they boast about their ability to be able to take off from most major airports with that super tank. But, again, that’s speculation. It’s something that I would like to research deeper but right now we’re still investigating the why question of this. And it appears that weather control is the number one reason. And, of course, corporations, governments gain a tremendous amount of power, unfortunately at the expense of all of this. One thing that these programs do, which we didn’t cover in terms of ecology, it sheds our ozone layer. And Noah just reported that significant loss in our ozone of the Antarctic. [0:30:19.9], again, are very open that these programs will shred the ozone, exactly what we’re seeing happen. So we used to have a UV index which went from 1 to 10. And now our UV index goes from 1 to 15. One thing that I’ve noticed and a number of other people have noticed, now we’re beginning to see in the summer months leaves that actually appear to be sheared. And I know that I used to be able to go out for several hours in the sun without burning – I can’t do it anymore. So our natural protective layer is being depleted and decimated actually I think is a more appropriate word. And Alan Robock, a geoengineer, said once we start these programs it will be next to impossible to stop them. Well, guess what, they have started these programs and they have destroyed and are destroying our atmosphere. So I think they essentially painted themselves into a corner. And the only way to bring the earth back to its natural balance is to stop these programs before it’s too late. Because, again, they’ve done a tremendous amount of damage, but I believe that Mother Earth can heal herself and that’s why I so heavily focused on the importance of this message in terms of waking other people up and becoming activists, because the only reason that they’ve gotten so far with this is because of the unawareness, the lack of awareness that we’ve had in the world. And for the first time, now, the first film, What in the World Are They Spraying?, has been essential in waking millions of people up. It’s been estimated to have been viewed by over 10 million people. It’s posted on thousands of websites. But, again, we started a worldwide movement. So there had been ordinances now at the county level that have been initiated to ban geoengineering programs on and around those counties. But we’re just at the beginning state. So I think it’s real important, too, this is not at all a message of fear. And I really want to point that out, this is a message of faith. We’re in a crisis. There’s no question about that. However, we have the ability to change the future of our world and we are stewards of the earth. This is our earth. We’ve been given responsibility over it. And our earth is being molested through these programs. So it’s really incumbent upon us to stand up and to take not only political action but action of waking other people up in a non-fear mongering way. Fear paralyzes. But faith – and I believe strongly that collectively we have the ability to stop this and bring Earth back to its natural state and that’s why I do this every day. Jason Hartman: Yeah. What’s interesting about this, Michael, is that the left-wing environmental movement doesn’t seem to have picked this up as an issue. That movement wants bigger government, more regulation, more trust in government which I think is completely unwarranted and less consumption, fewer rights of people to do their own thing. It’s sort of an oxymoron really it seems like. I mean we’re the environmentalists talking about this issue. Now, I would consider myself and you an environmentalist, more real and legitimate way, but you know what I mean when I’m talking about the left-wing environmental movement? It’s different. Michael Murphy: Yeah. And let’s take a look at that. And I think that’s a great question if we look at our environmental movement. We actually went into Green Peace and some of the other movements, spoke to this about this, asked why they weren’t covering it. And they said, well, politically it would take about five years to get through our various channels to start addressing this. But I’m gonna be blunt here. Our environmental movement, our large nonprofit organizations, are funded some by the Rockefeller Foundation, by the Ford Foundation. These people are very instrumental at bringing forth the new world order agenda. Chemtrials and Geoengineering programs are being perpetuated for those world government, for new world order. Because, again, if you want to create world government and you have a country over in Africa that wants to remain sovereign, they want to grow natural organic seeds, well, if you control the weather, you could just send a drought over there and that country will gladly give up its sovereignty and its resources for rain. And that’s what we see happening. So, again, these larger nonprofits, these environmental corporations are directly controlled by the same interests that control this globalist agenda. So, for the first time, this is a movement where we have to put faith in ourselves. We cannot depend on a corporation, on a government or anybody else to help us. This is something that harms us all in such a major way, but we have to depend on ourselves. And that’s what I’m hoping and that’s my mission is to collectively get us to stand up because I think in some ways we have been trained to put our safe and to put our trust in someone else. And I can’t tell you how many emails I get per week of some really good ideas that people have for me to do. And, if I took on 1% of those, I would never be able to do what I’m called to do. And the reason I brought that up is, again, we’ve been taught to put our faith in somebody else. And this time we all have to stand up. We have to put our faith in our ability to address it, to collectively stand up and to say no. And that’s sovereignty. In its essence, that is sovereignty. And I think through our school system, through the globalist agenda which has influenced our school system, we have not been taught that way but we have to change. We have to change because of corruption and putting our faith in certain corporations, certain individuals, no way. We cannot do it. Jason Hartman: Absolutely. Well, is there anything else you want to tell us about the health effects? We didn’t go into that in great detail. Just, in wrapping up, what else should people be concerned about health-wise? Michael Murphy: Well, these programs are very toxic to human health. In What in the World Are They Spraying we interviewed a physician who was an aluminum expert. And aluminum oxide is very toxic to human health. And, in the past 10 years we’ve seen a great increase in aluminum related illnesses. They are a catalyst to neurological illnesses and one of which is Alzheimer’s. In Riverside County, we’ve seen over 260% increase in Alzheimer’s. We also have memory loss and a number of other issues related with illnesses related with aluminum. Aluminum is accumulative in the body. If it’s not flushed out with natural systems, it will accumulate and compromise the immune system, resulting in cancer and a bunch of other diseases. But barium which is another primary ingredient, a group of about 26 people in Mojave county got tested, their blood for aluminum and barium, over 20 of them was considered to be over 1000 percentage points over the level considered to be elevated. Barium, many had very high levels of aluminum. And, again, this is not only showing up in our environment. It’s showing up in our bodies. And Barium is very toxic. It decreases our immune system and it creates high blood pressure. Many people notice on heavy spray days some of the minor symptoms like of burning eyes, irritability, nausea, dry mouth – when we breathe it in you will notice cottonmouth and headaches. But I spoke to some emergency room physicians who told me that during heavy spray [0:38:17] increase in heart attacks and strokes because barium also increases our blood pressure, so deeply concerning. And then strontium, it’s a carcinogen, so we can expect to see our immune systems compromised and cancers and a bunch of other illnesses. [0:38:33.4] mortality has gone from number 8 on the list of mortality down to number 3 in just the past 6 years. So we’ve seen a significant increase in a bunch of illnesses. And I really must say it’s important to note that there’s much more than just aluminum, barium, and strontium that’s being found from the fallout from these programs. So it’s a deep concern and I’ve spoken to physicians and scientists. I said quantify this, tell me. What are the risks associated? And I’ve heard from both parties the risks are unquantifiable. We can’t even fathom. Jason Hartman: Nobody knows, yeah. Michael Murphy: Nobody knows. But it’s not good. Jason Hartman: Anything more that you want to just tell people in terms of action steps they can take? And I know activism awareness, all of that is great. Watch the film, spread the word. But what can someone do on an individual level? Should they move out to the countryside? Should they move out to Antarctica? I mean where do they have to go to get away from this? Michael Murphy: Those areas are being sprayed as well. You may want to go to Kenya. But, again, geoengineers want to do this on a global level. They’re moving forward with legislation. They’re moving forward with propaganda to the public so that the public accepts these programs. So I really think we need to hold our ground. We need to get active. So one please see the film. And it’s important to know we’re encouraging anybody who purchases the film to please make copies and hand out for free. We have people around the country who are hitting the streets and getting the word out about this. And what that does, it does two things. I depend solely on DVD sales to continue addressing this. I address it 7 days a week, so it supports my work, but it also supports our vision of getting people activated and involved. So, please, you can find that at TruthMediaProductions.us or WhatintheWorldAreTheySpraying.info We encourage you to get active. Bottom line is we have to create awareness. And the film has woken millions of people up, but still awareness is very low on this issue. So I have started the Los Angeles Chemtrails Meetup Group and we actually go out and assist public events and we hand out free DVDs of What in the World Are They Spraying? – A free informational toolkit. But I also have gotten active with a lot of groups around the country in terms of getting country ordinance to pass, banning these programs. So I think once we get our areas and our communities active like we did in Maui – in Maui, we’re moving forward with the Clean Sky Ordinance, which again will ban these programs above and around Maui, but in order to get any ordinance through, you need public support. So I think the first important part is waking up your community. A number of people go to town hall meetings, a number of people get out into public. And that’s the important things. And please, have a local meeting in your area. I can’t stress the importance. Thousands of people have hosted screenings of What in the World Are They Spraying? That could be found on the Coalition Against Geoengineering website, some suggestion on that. And we encourage you to really get active and involve din hosting screenings. So I think the first step, again, is getting your community conscious, aware, then the second step is going into some type of political action. As you saw at the end of the film, we went to Washington DC and the corporate interests control our Congress, they control our senate. So we have had much more success at the local level. And that’s where I think we need to bring this initially. Get each and every county behind this involved with banning these programs and then we can bring it to the state level and then to the federal level. But we have to hit our own communities first. I can’t stress that enough. Jason Hartman: Good point. It all starts locally. Well, Michael Murphy, thank you so much for joining us today. These are some scary things to ponder and to think about. And people need to get involved and just really appreciate the insights and I know our listeners do too. Thank you. Michael Murphy: Thank you so much. Thanks again for sharing this and getting the word out. God bless you. Narrator: Now is your opportunity to get The Financial Freedom Report. The Financial Freedom Report provides financial self-defense in uncertain times. And it’s your source for innovative forward thinking investment property strategies and advice. Get your newsletter subscription today. You get a digital download and even more. Go to JasonHartman.com to get yours today.